Right from the start Stokowski gives us a romantically gorgeous First Symphony. In the andante ma non troppo lento Stokowski and his hand-picked orchestra italicise many of the details. The multi-miking which characterises the sound accentuates detail after detail yet Stokowski's reading avoids any suggestion of torpor. I suppose that the approach might be criticised for its highly idiosyncratic brand of spontaneous self-indulgence. However if this is the price of such life-celebrating music then so be it. Recently I have heard the early 1950s recordings made by Eugene Ormandy with what had for years been Stokowski�s orchestra, the Philadelphia. These are from early LPs and let me tell you I have rarely heard a better and more ruggedly vigorous Pohjola�s Daughter or En Saga - and there are some superb ones in the catalogue (Horst Stein, Furtw�ngler, Toscanini and a recently discovered treasure in the shape of Ole Schmidt�s recording with a striking Symphony 5 on Regis). Stokowski grasps similar freshness in this recording. In the first, third and final movements it is as if �Mr Velocity� Golovanov had hold of the reins; it�s quick! Listen to the way he pushes and pushes the envelope at 4:02 in the finale - has the harp figuration ever sounded so urgent? Beecham�s Lemminkainen�s Return is a byword for a hell-for-leather ride (though Ormandy�s 1954 version is even more urgent). Stokowski is just as driven but his pealing and throbbing golden-toned violins (7:21 IV) pulsate with passion and do not seem hurried. Not all is beautiful in this garden. The sound is beefy upfront honest-to-goodness mono, the perspectives are constantly shifting and zooming in for solos or out to accommodate fortissimos, in the first movement at two transient points the pitch sounds watery and analogue hiss is somewhat in evidence though soon cancelled out by the listening experience. I still rate Barbirolli�s Hall� EMI Classics recording of the First Symphony (only available as part of a complete cycle which elsewhere is very uneven) but if you cannot do without Stokowski yet want better sound than he could deliver in 1950 you have no choice other than to track him down conducting another �scratch� orchestra, Sidney Sax�s National Philharmonic, this time in West Ham Central Mission, London in 1976. This was amongst his last recordings, first issued on a Desmar LP in the late 1970s. It is an outstanding reading but in every movement he takes longer than he did 25 years earlier though in some cases only by a handful of seconds. The pulse of Stokowski�s Second Symphony is monumental rather than quick. The flame burns steadily rather than greedily. There are some impetuous details in the first two movements (the gruff rip of the brass at 8:30 in II) but overall the progress is sturdily epic. The recording is more subtle than in the First Symphony taken down four years previously. Here there is less spotlighting and you may well find yourself missing that guilty pleasure. My thoughts went back to the same conductor recorded at the 1964 Proms when he also turned in a lower key Sibelius 2. Among the great versions of Sibelius 2 you must hear the Chesky CD of the RPO/Barbirolli and Ormandy and the Philadelphians superb in 1958 on Sony SBK53509. The most volcanic 2 ever can still be had from BBC Legends 4154-2 - it�s Beecham conducting (and bellowing at) the BBCSO at a live RFH concert in December 1954. Cala�s documentation is excellent. There�s a scene-setter by Edward W Clark, an artistically wide-ranging essay by Stokowski from the sleeve of the 1954 LP and a study by the redoubtable Edward Johnson of Stokowski as a Sibelius champion. This remains a must-have for Sibelians jaded with recordings of the First Symphony heavy with the orthodoxy of our days. If the Second Symphony is not as special it is well worth hearing for its epic stride. Stokowskians will already have snapped up their copies. 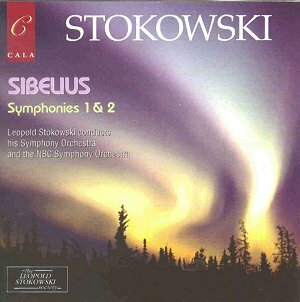 More Stokowski Sibelius please. 1.� The recording of the First Symphony with the National Philharmonic was originally a CBS issue, and not Desmar.� Only two recordings Stoki made for Desmar were the Rachmaninoff Third with Vocalise (National Philharmonic), and the Dvorak String Serenade with a little Purcell encore (Royal Philharmonic).�� I haven't heard the Cala reissue of the Sibelius First, but I always had trouble with the CBS LP, then the Sony CD because of what seems like an excessive amount of resonance that clouds a lot of detail.� I've read that the Cala is an improvement. 2.� I think the best way to hear Stokowski in the Second Symphony is a live performance with the Phillies from the 60s which was included in a Philadelphia Orchestra issued box a few years back.� The sound is excellent, and of course, the orchestra plays like angels.� I certainly agree with you that the Chesky issue of Barbirolli's recording for Reader's Digest is a truly exalted document.